Now that I’m knitting again I’ve set myself the goal of finishing the 2 FOs I had. 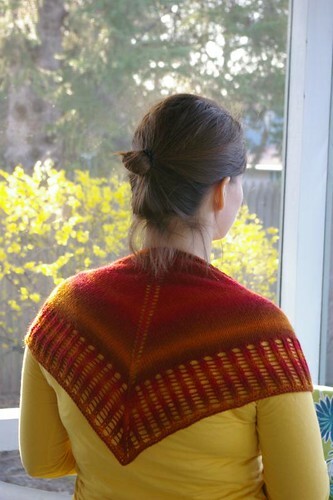 One was Little Colonnade and the other the Ursa cardigan. A couple weeks ago, after working on it for a few days I finished the first project, Little Colonnade. 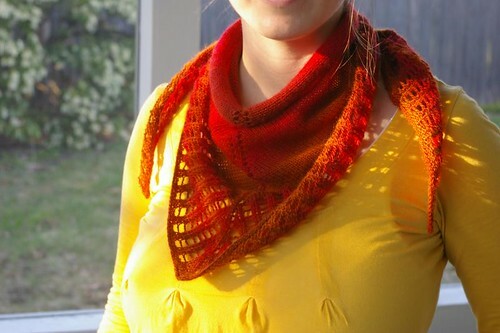 It went really fast and now I have a nice new shawl to wear! I wanted to post this earlier but I was waiting for a photo shoot with DH. Finally this weekend we were both available and the weather was nice so it was time for some photos! Now that the cowl is done I’ve been knitting almost exclusively on my cardigan. It’s slow going but I’m still making good progress. 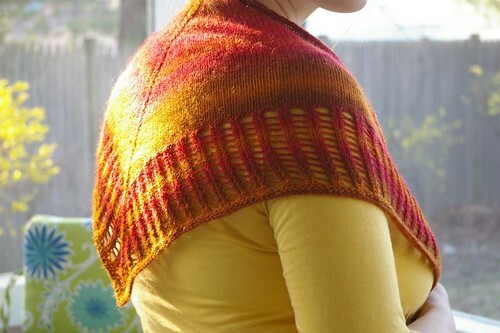 So far the sizing looks great but my only concern is that I just might run out of yarn… Just as a heads up, check your stashes for some Cascade 220 in colorway 9422 (Tibetan Rose). I’ve also cast on for a pair of socks (of course) but am keeping it as a travel project. This next neckwear was not made by me but by the uber talented Maritza of Soto Softies. 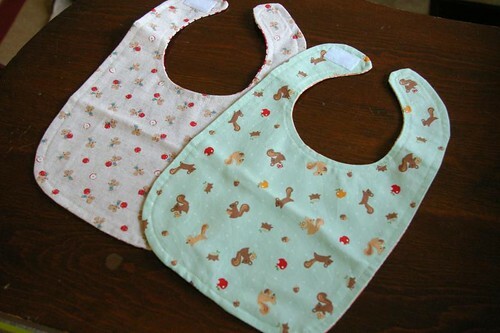 She’s expecting a little boy in a few weeks and made up the cutest bibs for her baby. She also made a few extra ones to give to other pregnant ladies and I ended up being one of the lucky ones! Aren’t they the cutest thing ever? I can’t imagine getting these lovelies dirty, but I expect they’ll catch a lot of drool soon enough. Thank you Maritza! I want to thank all of you for your wonderful comments last week. I loved reading all of them, you guys are so very sweet. And thanks for hanging on when this blog was so very quiet. Energy’s back, the new house is getting better organized every day and I’m actually knitting and sewing again! 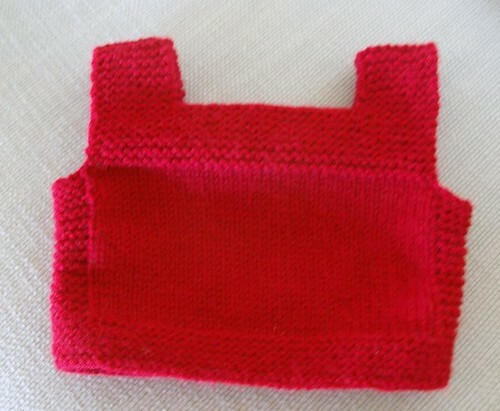 So about a week ago I finished a cute little vest for the baby. I really wanted to try Pebble as I thought it looked like something that I could manage easily and would still look cute. I wanted to avoid buttons so I knit in the round and did a 2-needle bind off on the shoulders. 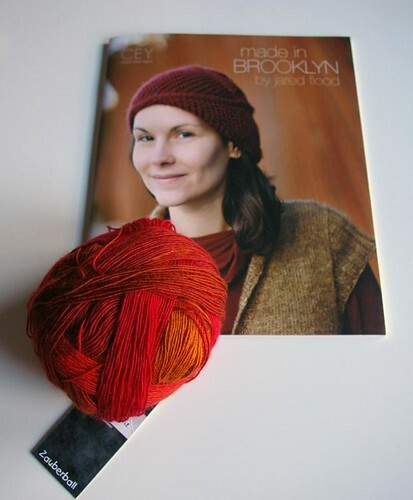 I had this one skein of Lion Brand Wool-Ease in the stash so decided it would be perfect for this little project. I don’t really know when this will fit exactly but I expect it will fit someday! After knitting the vest I still have plenty of yarn leftover, so I’ll knit a pair of legwarmers and maybe a hat. 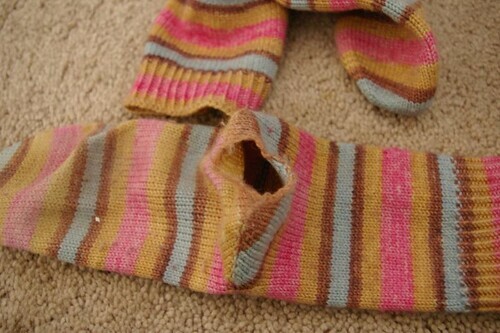 One big gaping hole in my Yarntini self-striping socks : ( . I knit these socks in the summer of 2007 so I can say they’ve had a good life. The color had faded quite a bit but they were still lovely. They will be missed. But at least I can replace them by another pair of self-striping socks (with nylon this time) which should last me another many more years. 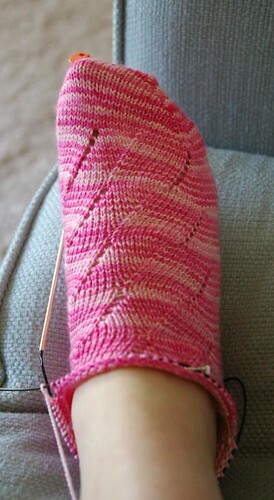 These socks were knit toe up, short-row heel with a stockinette foot and 3×3 ribbed leg. So now I don’t have any socks on the needles! 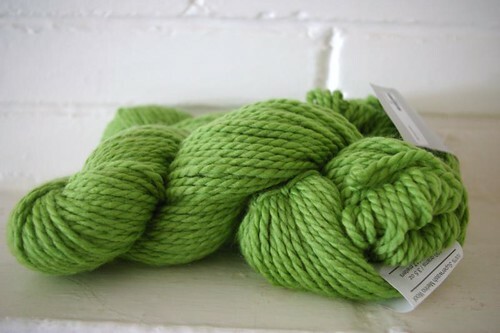 Time to wind some yarn and find an easy pattern. 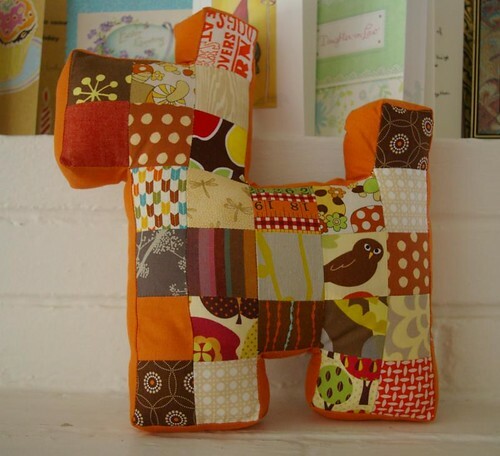 Any suggestions for an easy, mindless pattern? Let’s see. I’ve been gone from this blog for 4 months already. It does feel like it’s been forever and I hope some of my readers are still out there! I know at least one of you is, thank you Becky for inquiring after me, that was very, very sweet of you. and it’s also the reason why I’ve completely disappeared and have barely knit or sewed a stitch in the last 4 months. It might not look like much in the photo but from where I’m sitting, it’s pretty impressive! I’ll be 20 weeks tomorrow and it we just found out last Friday that it’s a boy! The first three months I could barely drag myself to work, let alone do anything else. Things are starting to turn up and I feel more like myself energy-wise. 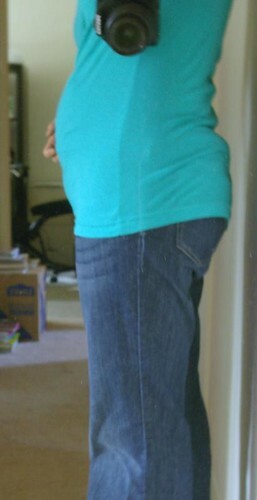 I’ve had to switch to maternity pants already and it sure makes a difference. Also, I’m awfully thankful for extra long tanks and shirts from Target. 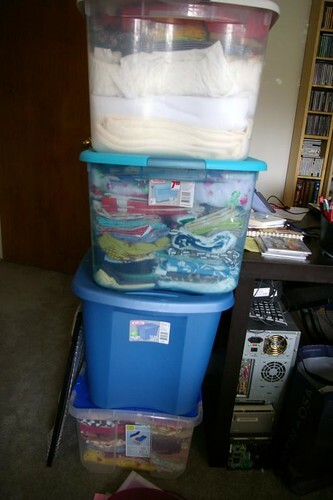 That’s 4 totes full of fabric. And so you get a better idea, I only had 2 totes worth of yarn. Which were put away the first weekend. The only reason I haven’t put it all away yet is that I ‘d like to reorganize the whole fabric stash and can’t quite work up the energy to start the process. 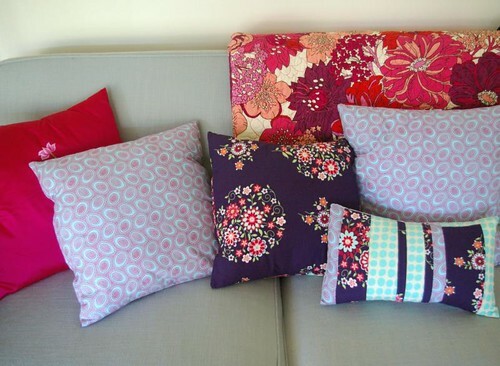 I do plan to start sewing again as soon as my office/sewing area is settled again and I can’t wait! I’ve been knitting a tiny bit here and there and I will show you that on my next post. 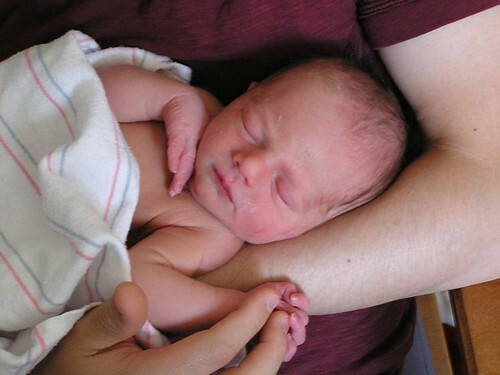 Yes, I hope to start blogging more regularly again, at least until the baby comes! Stitches has been over for what, 3 weeks already and I’m just getting around to doing a recap post. Sorry ’bout that, things are pretty crazy around here. No swine flu here, not even the regular flu, just a lot of work and not a lot of free time. But tonight I have some time, so, yay! Stitches was fun, I even got to see some of you, although I did miss a few of you too as I left early. The yarn4socks booth was quite nice I thought but since photography wasn’t allowed I didn’t take any pictures of the booth. 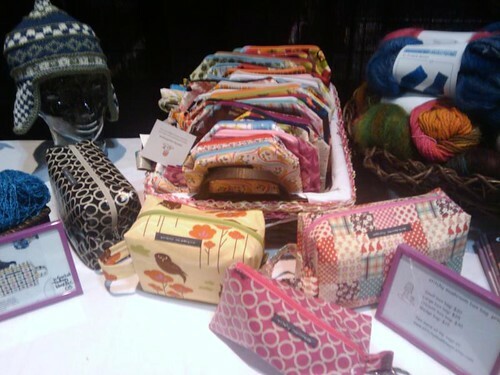 I did sneak quick camera phone pictures of my box bags before the marketplace opened though. They’re not very good but they’ll have to do. I hadn’t had a chance to see Jared Flood’s new book yet but I knew I wanted to make the vest on the cover. I was also attracted to the colors in the Zauberball and just had to bring one home with me. I knew I wasn’t going to knit socks with it but I knew that it would be perfect for a pattern I had just purchased, Little Colonnade by Stephen West, which you saw last week. On a side note about Stitches: Did you know that the first thing I noticed the first time I walked onto the Marketplace was the full rows of Socks that Rocks at the Webs booth. I couldn’t believe it but I later found out that Webs is now going to be carrying STR, not online though but only in their store. 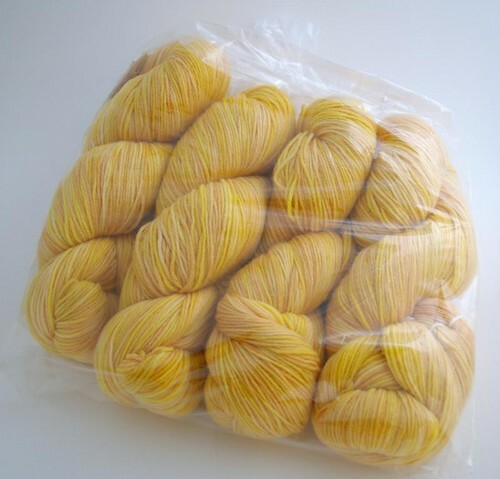 What I thought was ironic was that the previous weekend, people were lining up for hours at the STR booth at Rhinebeck to get a skein of STR (I probably would have too, if I’d gone) and it was available right there a few days later, without any queuing involved. So if you’re in the market for STR, make a little trip to Webs, you’ll be able to buy all you want! After Purple, come the Reds and Oranges. On the left are a pair (well, not quite a pair) of sleeves for my Ursa cardigan. Now that I don’t have any deadline knitting anymore I’ve decided to work mostly on my cardigan so that I could maybe have it done by Christmas. I don’t think that will happen but you never know, and it is good to have goals! 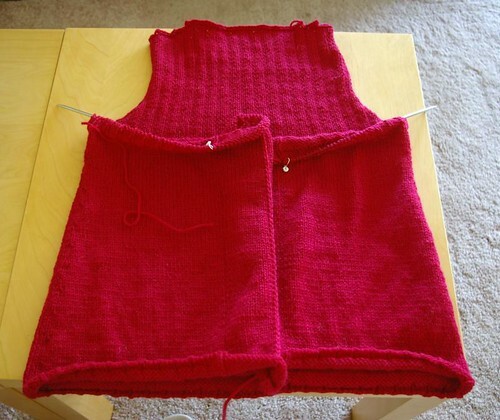 I’m really looking forward to starting the body of the cardigan. The other project is Little Colonnade by Stephen West knit in the Zauberball I bought at Stitches East (I just realized I never showed you what I got at Stitches!). I’m about 2/3 of the way on the stockinette section and the rows are getting long! 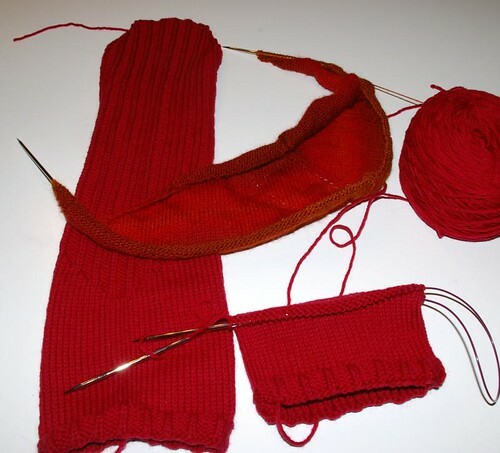 I only have these 2 projects on the needles, no socks at all. I will be traveling in a few days so will definitely need to cast on for a pair before I leave. Any suggestions for cool sock patterns appropriate for traveling?